[Updated Sep 26] Earlier today, September 20, Ian and Bron Gillan were the guests of honour at the grand opening of the music school in Gyumri, Armenia. This is the very school rebuilding which was the main focus of Big Ian’s recent WhoCares project with Toni Iommi. Well done, gentlemen! At the press conference the night before, Gillan also mentioned a possibility of starting an album with Tony Iommi. Although we at the THS ivory towers remain sceptical as between Sabbath reunion and his cancer treatment Iommi kinda has his hands full at the moment. 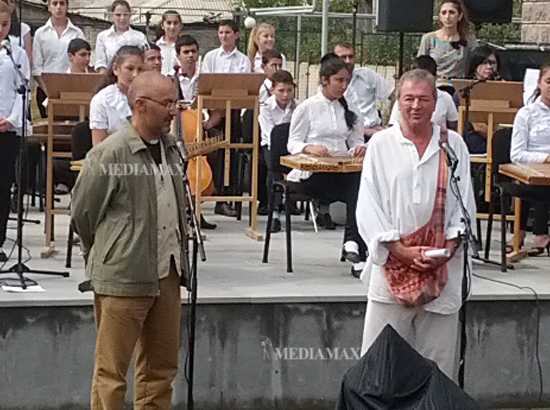 Read and see the coverage of Gillan’s visit to Armenia from Mediamax: press conference, school opening. [Update] Photo gallery: Gillan’s three days in Armenia. Check out the cake! Thanks to BraveWords for the heads up. Posted by Nick Soveiko on Friday, September 20th, 2013, filed under News. You can follow comment on this post through the RSS 2.0 feed. You can leave a comment below, or trackback from your own site. A great singer but also a great man !!!! Great work Ian and everyone else who have made this come thru! Mission accomplished. I am sure a proud moment for IG & friends. Congratulations! Ian, you are a good man and true a hero! I’m sure Tony Iommi would have Loved to be there. I hope he is still on the mend. Drdp@6- Iommi went straight back to get another ‘infusion’ shot of chemo I think, as soon as he finished the current (US/Canada) Sabbath gigs! He did that after the Oz/NZ tour as well. He has to do that every 6 weeks or so from now on, that is the only way he can keep going, from what I have read from his comments over the last few months or so! God bless him! Cheers. Who Cares, great double cd!! Love it!! !